Flowerama offers same day flower delivery into Upper Arlington seven days a week 363 days of the year and has been doing so since 1990. For more then 25 years Flowerama has been one of the most popular flower shops for the people who live work and play in Upper Arlington. 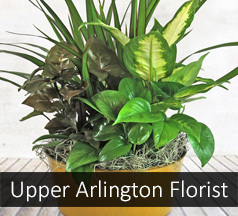 "Upper Arlington Dazzle" is the custom made flower arrangement Flowerama's design team created for the city. Family owned and operated with four design retail flower shops, Flowerama is the award winning florist in central Ohio. Want to speak to one of the experts at one of our shops call 614-256-6646.